The Law Offices of David A. Black has announced that it will be offering an educational scholarship again this year. 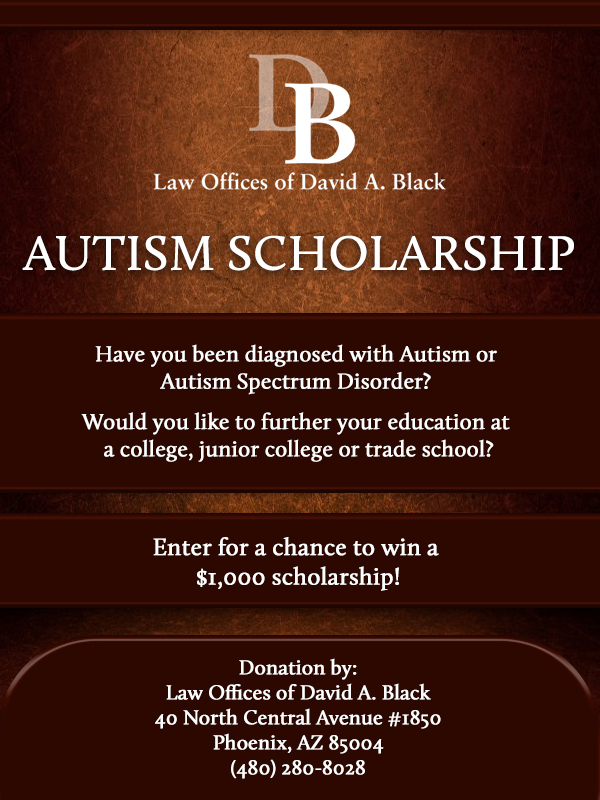 The scholarship is for individuals who have been diagnosed with autism. This is a $1,000 scholarship in the form of tuition assistance and is intended as an incentive to applicants to further their education. Autism, now known as Autism Spectrum Disorder (ASD or autism), refers to a number of disorders that can impair one’s ability to interact and communicate with others. ASD includes some disorders that were formerly considered distinct, such as childhood disintegrative disorder and Asperger’s syndrome, among others. “Spectrum” refers to the fact that both the symptoms and the severity may vary widely from individual to individual. Citizens of the U.S. who have been diagnosed with Autism/ASD (DSM-V) and who intend to further their education at a college, junior college or trade school are eligible to apply for the scholarship. Applicants need not be currently enrolled in school in order to submit an application. However, the scholarship must be utilized within 1 year from the date of the award. The application, together with all uploads, must be submitted to us by February 10, 2020. The award will be announced no later than June 22, 2020. The winning applicant shall be selected by David A. Black, Esq. at his sole discretion. • A statement of up to 150 words, to be uploaded, discussing your educational goals. • An optional statement of up to 750 words, to be uploaded, discussing how ASD has affected your education. In addition to the application, we may request proof of your diagnosis. The information submitted to us becomes the property of the Law Offices of David A. Black. We do not sell your information to anyone, nor do we disseminate it, other than for the purpose of publicizing our firm’s scholarship program or reporting on it. Please confirm: What is three plus three?